In August and September, the general public’s attention was focused on the dispute between Belaruskali and Uralkali, the world’s two largest producers of potash fertilisers. The conflict between two economic entities created additional difficulties for the Belarusian potash industry, as well as stimulated lower prices on the global potash market. 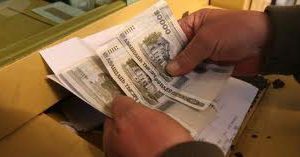 At the same time, positive trends occurred on the foreign exchange market domestically among Belarusians as the demand for foreign currency decreased. The end of the holiday season and the growth of deposit interest rates helped to reduce demand. The suspension of consumer price growth is also a positive factor. There were positive developments in the foreign exchange market locally in August. During the summer period the increase in net demand of foreign currency from citizens was the main problem in this segment of the foreign exchange market. While in April-May the population sold on a net basis about $194m, in June-July 2013 net demand amounted to $886.6m. These fluctuations were the result of several factors. First of all, fluctuations in the Belarusian ruble increased in June and July. On the one hand, the smooth nominal devaluation of the exchange rate of the national currency is a natural process under the conditions of the moderate rate of inflation in any country. However, even a relatively weak depreciation contributed to the growth in demand for foreign currency by citizens that was caused by a very low degree of confidence in the national currency. The holiday season was also a stimulating growth factor in the demand for foreign currency. People are more actively go abroad during summer which directly leads to an increase in personal expenditures in foreign currencies. Finally, another important growth factor of purchasing foreign currency was an interest rate decline on ruble deposits in May-June. The decreasing attractiveness of bank deposits in Belarusian rubles in the context of strengthening fluctuations of the Belarusian ruble against foreign currencies helped to stimulate people to transfer part of their ruble savings into foreign currency savings. As a result, in July, there was a reduction in citizens’ deposits in Belarusian rubles by 7 per cent, while foreign currency deposits increased by 4.4 per cent. The situation improved in August. Although the demand for foreign currency by the population still exceeded supply, its volume significantly decreased. Net demand came to $167m in August. The positive dynamics are due to the end of the holiday season and to the increasing attractiveness of deposits in Belarusian rubles through some growth rates on ruble deposits. In addition, the slowdown in real income growth influenced the dynamics of demand. It is expected that this positive trend will continue in the currency arena. One of the commanding positions in the nation’s industrial production belongs to the chemical industry. JSC Belaruskali – one of the world’s largest producers and suppliers of potash fertilisers is one such example. Belaruskali is a GDP-bolstering enterprise and overall it is the largest exporter in Belarus. Starting this year, the chemical industry experienced several difficulties. Thus, the volume of industrial production in January-July 2013, when compared to the same period in 2012, decreased by 26.5 per cent. One of the reasons for this decline was a drop in potash fertiliser prices in foreign markets. The collapse of the union of Belaruskali and Uralkali contributed to a further reduction in the industry’s prices. Since the beginning of the conflict between the two companies supply prices of potash fertilisers on the world market have already declined by 15-20 per cent, which will undoubtedly affect the future results of the Belarusian potash producer. The need for the rapid development of its own retail network is an additional problem for Belaruskali. In the aftermath of the termination of the joint trade agreement between Belaruskali and Uralkali, known as the joint stock company Belarusian Potash Company, the Belarusian potash producer has to build a goods-producing network independently. The company is trying to get out unscathed of this difficult situation. So, ​​a decision to create a new trader Belaruskali – JSC Belarusian Potash Company has been already made. A presidential decree has also removed the levy on export duties from 1 September 2013 to 31 December 2013 to ensure that Belaruskali stablility with its operations. The duty was €75-85 per ton of potash fertilizers. The amount of the fee depended on the country of destination. These measures will undoubtedly contribute to an improvement in the company’s work and its competitiveness. At the same time, the undeveloped goods/production network and ambiguous situation with the price of potash fertilizer remain the main challenge in the short term for Belaruskali. The limitation of price increases remains one of the priorities for economic policy. Here should be mentioned a record decline of inflation occurred in August. In the reporting month in relation to July 2013 consumer prices were up by 0.1per cent only. Slowdown in inflation is partially due to seasonal factors. Traditionally, there is a decrease in prices for fruits and vegetables in summer, which undoubtedly influences the overall dynamics of prices. Indeed, food prices in August fell by 0.6 per cent mainly due to lower prices for fruits, vegetables and potatoes. Base consumer price index, which excludes changes in prices for individual goods and services regulated by the state, as well as seasonal goods, grew by 100.8 per cent over a month. In August 2012 this figure amounted 101.7 per cent. Thus, even taking into account seasonal factors, the rate of inflation in the country in August compared with the same period of last year, slowed down. The prices for services increased most rapidly in the post-crisis period. Increase in prices for services amounted to 119.2 per cent during eight months of 2013. One of the reasons for the rapid growth is a gradual increase in state prices for utility services and public transport. Compensation of costs associated with these services have remained at a low level in Belarus. On 17 August, Minsk cycling fans gathered to make an unusual ride – they agreed via social network to dress in 1950s style clothes. Around 50 people participated in the event, and it even drew the attention of Belarusian media. Yet on 2 September police summoned Iryna Bijnik, the organiser of the ride. The police composed a record of evidence and the same day the trial occurred – Iryna received a fine for organising it. It came as a surprise to her and her friends when they learned that she had violated the law on mass actions, amended after 2011 silent protests. According to it, any public announcement of collective action (including the Internet) should receive the authorities’ permission. Now, a company of friends that agreed to have a drink on Facebook can theoretically be accused of breaking the law. Events with similar outcomes happened in Vitsebsk and Brest earlier in the summer. They indicate that the regime still perceives organised citizens, even apolitical, as a threat to its stability. The 2011 summer appeared to be a quite nervous time for the Belarusian regime. With the Arab Spring in the background, it experienced the one of its most serious economic collapses and the widespread dissatisfaction of the public with state policy. This led to mass protests, which took place in many cities of Belarus and received the name “silent protests”, because people clapped hands instead of shouting slogans, which authorities could qualify as a violation of mass political actions and therefore initiate legal proceedings. The authorities quickly realised this loophole in the law and in early autumn of 2011 the notorious Minister of Internal Affairs Anatol Kuliašoŭ presented amendments to the law before the Belarusian pocket parliament. The parliament announced that its sessions were closed for media and adopted the amendments in one day, as hardly any discussions are possible when it comes to the regime’s security. According to the amendments, organisers of an event cannot publicly invite people to participate in it before they receive permission of local authorities. Importantly, this concerns any mass gatherings regardless of their aims – political, entertainment, or any other. The law also extended the list of places where mass actions cannot take place, and stipulates how those places, where organisers who have received permission, must have surveillance devices, fences and checkpoints. Civil society took the amendments as a further restriction on civil liberties of Belarusian citizens, although the authorities rarely apply it since its adoption. However, in the summer and autumn of 2013 several cases of its ridiculous application finally took place. On 17 August, Minsk cycling fans gathered to make an unusual ride – they agreed to dress in 1950s style via social network. The event drew the attention of Belarusian media, which reported around 50 participants. Iryna Bijnik, who organised the ride in social networks, said they did not plan any particular number of participants. All interested people could join the ride. After two weeks, Iryna unexpectedly had to visit the police. The same day the court imposed on Iryna a fine of BYR 2m ($220). The police initiated the case because one policeman noticed the information for the gathering on the web after it had already happened. No policeman witnessed or made a report of the live event on the day it happened. The head of Minsk cycling society Jaŭhien Charužy considers this fine a dangerous precedent. 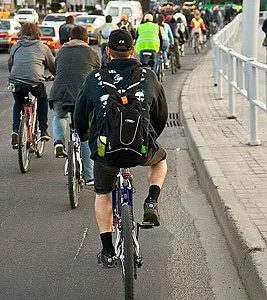 “Collective cycling takes places almost every day in Minsk, and up to 250 people take part in it. It is often spontaneously organised and it is hard to define the organiser”, he says. Now, as such cases are starting to happen, the police can interpret any gathering of people as an unauthorised action and therefore declare it as illegal. It turned out that not only the Minsk authorities see collective cycling as a potentially dangerous action. A similar case took place in Vitsebsk on 5 September. Uladzimir Bulaŭski had already organised two cycling tours around Vitsebsk for all interested people and was going to hold another one. He arranged the meeting on a social network and provided his contact information, but the authorities did not contact him on. Instead, on the day of the tour the cyclers found a number of policemen in the place of meeting. The police fined people right on the spot and even those who had no intention to participate received fines. Some people were detained for “absence of rear-view mirrors, bell and flashing lights”. Bulaŭski says the cyclers will definitely fix all necessary technical issues if the problem lies indeed there. But it seems not to be the case. Earlier in July, another curious happening related to the law on mass actions occurred in Brest. During the opening of a new mall, the company decided to surprise the people and organise a candy shower. It announced that at the opening ceremony they will throw a ton of candy from the roof of the building. The organisers requested an action of 500 participants at local authorities for this occasion. Instead, 5,000 people came while only 6 policemen were sent to keep order. The police ordered not to throw the candy to avoid a stampede, but the organisers ignored their orders. As a result, the police initiated a case against them for breaking the law on mass actions. Authorities try to explain that a public announcement in social networks can be dangerous, because it can gather an inestimable number of people and the situation can get out of control. Some officials understand that permits for daily collective actions of citizens like cycling seems ridiculous, but they have to obey the law and recommend to cooperate with authorities on these matters. For instance, they suggest that people hold their actions under the aegis of local authorities or security services, which do not need permission for such actions. But the reason behind the actions of authorities appears not to be their concern for the safety of the participants. They simply demonstrate that citizens in Belarus have no right to associate with one another without the state’s approval and control. Such irrational fear of harmless actions like cycling looks like nonsense, but it precisely shows the logic of the regime-society’s current coexistence. The people in power regard organised citizens not as partners in the resolution of public problems, but as a potential danger to regime stability. Therefore maintaining an atomised society remains a priority of internal security in Belarus.